This bike is for children who can bike on their own and have bike experience with distances till25 kilometers per day. If you want to know if you are you going to make the right choice we advise you to make a long bike ride before your vacation in Egmond aan Zee. 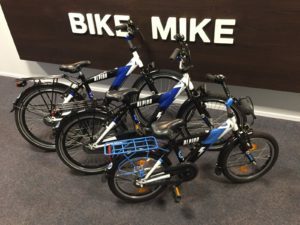 The BikeMike children’s bikes have a sturdy look which will make your child proud to ride this bike. • A children helmet is not included in this price.